If you have already downloaded iOS 5, you might be wondering how to jailbreak it. 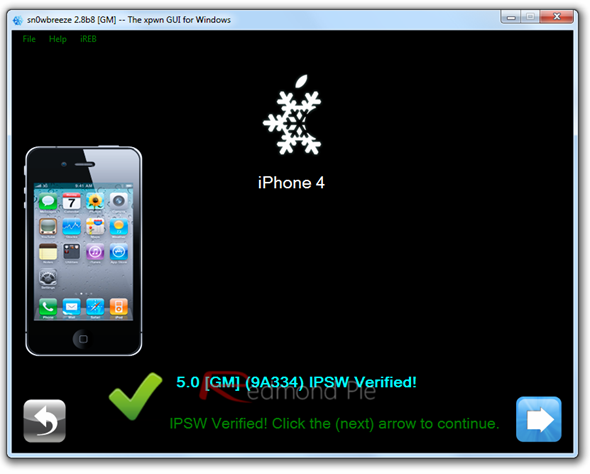 Besides Redsn0w, Sn0wbreeze is a tool to consider, assuming that you’re using an iPhone 4, iPhone 3GS, 3rd-generation iPod touch, 4th-generation iPod touch or any other A4 powered device. iPad 2 and iPhone 4S support is not present as of yet. * INSTANT IPSW detection (seriously!). * Now jailbreaks iOS 5 Gold Master (9A334). * UDID Developer check removal is no longer needed. 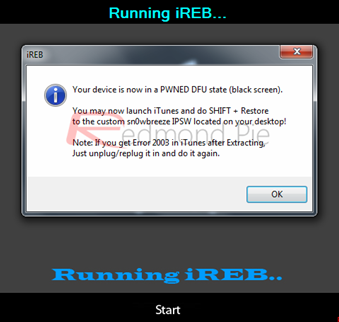 This is a tethered jailbreak: this means that you’ll need to plug your device into your computer running a special application whenever your device is powered on, in order to boot it into a jailbroken state. We’ve included steps on how to perform this at the end of this guide. 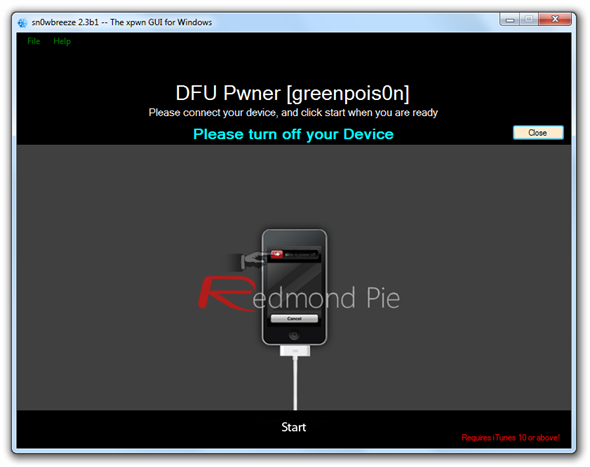 A supported device running iOS 5, which you can download for your iOS device from here. The latest version of Sn0wbreeze, which you can download from here. #1: make sure you have your iOS 5 firmware ready and launch Sn0wbreeze. If all goes well, you should see the window below. Click the blue arrow on the bottom right corner. 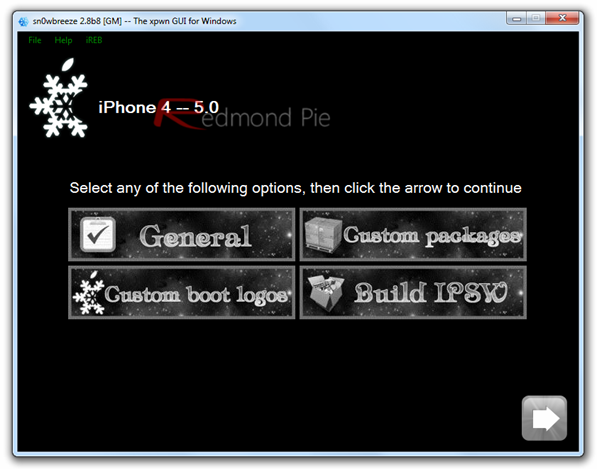 #2: you should now be given the option to locate the iOS 5 firmware file. Make sure it’s selected, then click on the blue arrow once again. #3: if all goes smoothly, your device’s model as well as the firmware version you’re trying to jailbreak should be displayed. If the information displayed is accurate, you should be good to go. #4: the next screen should enable you to choose which mode you’d like to use to perform this jailbreak. If you’re planning to unlock your iPhone, select "Expert Mode". Make sure you click on the blue arrow afterwards. #5: you should now be given a wide array of options. If you’re not sure what to do, just select "Build IPSW" and click on the blue arrow (again). You’re almost done! Sn0wbreeze will now use its magic powers to pwn the iOS 5 IPSW file. No user interaction is required at this point, so feel free to drink a cup of coffee or play Pac-Man. You’ll be notified when the process is done; until then, do not exit Sn0wbreeze. #6: plug your device, if you haven’t already, and hit "OK". 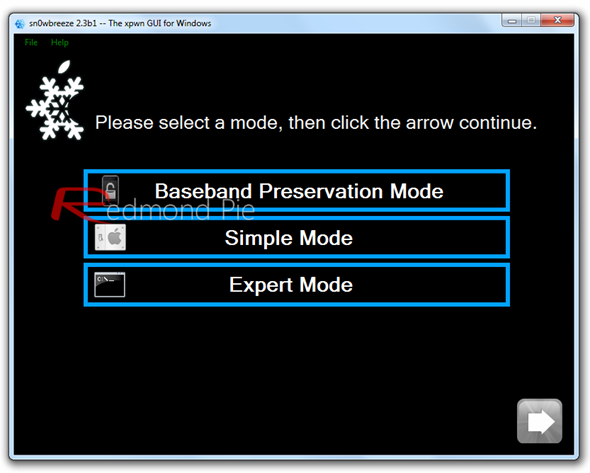 Then you’ll be asked to enter your device into DFU mode, which you can do by following the on-screen instructions. If all goes as expected, your should get a confirmation prompt and your device’s screen should be black. #7: it’s now time for you to load the custom firmware onto your device. In order to do that, open iTunes, locate your device on the program’s sidebar and click on "Restore" while holding the Shift key on your keyboard. Select the modified firmware, hit OK and wait while iTunes applies the jailbroken firmware. Do not interrupt this process. As we mentioned at the beginning of this guide, this is a tethered jailbreak, meaning that your device will have to be plugged in to your computer every time it’s powered on, in order to boot into a jailbroken state. You’ll need to follow these steps every time you power up your device. #1: launch iBooty and select your device from the drop-down and hit "Start". If you’ve just jailbroken your device, which is likely the case if you’re reading this guide, iBooty should have popped up automatically. #2: once you’ve pressed the button, you’ll need to enter DFU mode by following the on-screen instructions. #3: let iBooty work its magic and be sure not to unplug your device yet, you’ll be instructed when to.